The National Oceanography Centre (NOC) is engaged in research into the potential risks and benefits of exploiting deep-sea mineral resources, some of which are essential for low-carbon technology, as well as using ocean robots to estimate the environmental impact of these potential deep-sea mining activities. Late last year the NOC led an expedition on the RRS James Cook that found enough of the scarce element Tellurium present in the crust of a submerged volcano that, if it were all to be used in the production of solar PV panels, could provide two-thirds of the UK’s annual electricity supply. 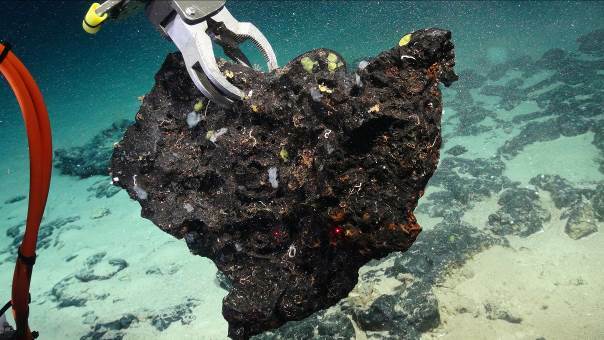 Recently, the NOC also led an international study demonstrating deep-sea nodule mining will cause long-lasting damage to deep-sea life, lasting at least for decades. These nodules are potato-sized rocks containing high levels of metals, including copper, manganese and nickel. They grow very slowly on the sea-bed, over millions of years. Although no commercial operations exist to extract these resources, many are planned. Part of the NOC’s research into this area involves leading major research programmes into the exploration of potential resources. This includes: seafloor massive sulphides, which provide ores rich in copper, zinc and gold, and iron-manganese crusts rich in cobalt, tellurium and rare-earth metals. NOC scientists have also carried out multiple research expeditions to study the environment around areas with resources that may be the target of future mining. This includes the Clarion-Clipperton zone in the eastern Pacific, the Mid-Atlantic Ridge and Atlantic Seamounts. This research is revealing extremely high diversities of deep-sea life, as well as a surprising variation of subsea landscapes, each containing different lifeforms. Dr Daniel Jones from the NOC, the lead author of the study, said, “the deep-sea is a remote, cold and dark environment kilometres below the surface of the ocean, yet it is home to a wide variety of marine life, much of which is very poorly understood. This research analysed all available studies on impacts to ecosystems in nodule areas and shows mining for nodule resources on the seafloor is likely to be highly destructive in the mined area, with long lasting impacts. We also think that these studies will underestimate the impacts of mining. Many would not even represent one month’s work for a full-scale commercial operation, which might last for twenty years. The NOC led MarineETech expedition on board the RRS James Cook aimed to improve understanding of what controls the formation and accumulation of cobalt-rich crusts on seamounts. These crusts are rich resources for scarce elements that are critical to securing a low-carbon future, through technologies such as solar photovoltaic, wind turbines and electric vehicles. The results show the accumulation of the cobalt-rich crusts on the sea-mount depends on; the direction and strength of currents and deep-water tides, the depth of the water, and biological activity. To find out more please click here to read or watch the BBC report on this topic, featured on last nights BBC news.